Currently 279 but with code EASTER10 can be had for £269. Cheapest around at the moment for these. Any idea on when the new model will be out? Chose the XM3 over the QC35ii. Probably the most comfortable pair I've worn, with excellent noise cancelling (13 hour flight from HK to prove it's worth) and battery life to boot. Bought in HK for £220-230. Great deal for UK stockist. Another very impressed owner of these.. paid 216 with the ebay deal recently though. 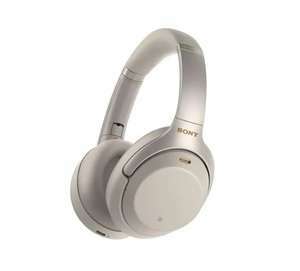 Sony WH1000XM3 are better than any product from competition so they don't have any reason to do replacement product. Apart from adding few Bluetooth options like pairing with two devices and extra button to switch between paired devices there's not much needed to be improved. They beat Bose qc35ii straight away as they come with LDAC and aptx-hd bluetooth support, usb-c, fast charging which Bose lacks from. They'll continue to sell them until competitions makes better product - which may take a while. Also Sony skipped this year AV Receiver as well as their STR-DN1080 is a hell of an amp for a few hundred. I have the first gen, use for holidays only really, worth upgrading? If you want better NC - yes. I can't really comment on the NC feature because I never used them long enough but really, headphones are speakers over your ears and I found these were tuned to be very bass heavy with almost non-existent mid range and a muddy high end. I asked the person demoing them if that was how they were supposed to sound, it was that bad. He said that some people like the way they sound. I ended up buying a pair of Sennheiser Momentum 2.0's for £80 less. Anyone know if a newer WI-1000x with USB C is to be released anytime soon? Bought these for £200 as per the deal from here about a month ago and my oh my, what amazing sound. By far the best noise cancelling on the market. For any of you enthusiasts who are on Android and rooted, download Viper4Android app to use alongside these and you'll be highly impressed. I had the 2 and upgraded to 3. There is a noticeable difference.